It was a long walk to the Parish Church and, after the coming of the Great Western Railway and the population increasing owing to the brickfields being opened in the district, the inhabitants of Hillingdon set to work to provide for the building of a Mission Church (also referred to as a Chapel of Ease) capable of holding 280 people for the district of Yiewsley. This Church, designed by Sir George Gilbert Scott and dedicated to the Glory of God under the patronage of St Matthew, was consecrated on the 6th July 1859 and was staffed by curates from St John's. The greater part of this original church formed the North Aisle and Lady Chapel of the present building before it was remodelled. On the left of the reredos of the Lady Chapel can be seen the words Ave Maria, "Hail Mary", above the Alpha sign. This is matched on the right by theOmega sign, above which there is a panel bearing the words Ecce Ancilla, "Behold Thy Handmaid". Miss Cecile Mowbray, a life long friend of Canon and Mrs J S L Jones, did this painting on the reredos in the late 1920s. The angels are a copy of angels painted by Era Angelico whose picture of the Annunciation appears in the panel in the centre of the Reredos. It appears that the church was not licensed for weddings for fifteen years — the first wedding recorded is 24th May 1874. 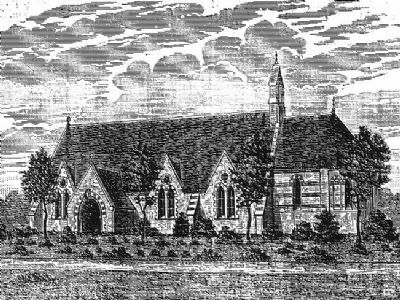 The influence of St Matthew's on Yiewsley further increased with the opening of its Church School on 8th April, 1872, the foundation stone having been laid by Bishop Claughton seven months earlier in August 1871. The subject of the organ for the Church was first mentioned in February, 1873, when we read that a concert was held to raise money for the organ fund. Yiewsley became a separate Ecclesiastical Parish in 1874, although it did not become a separate civil parish, with its own council, until 1896. The Revd Albert Eden Seymour was the first Vicar of Yiewsley and later in his ministry, became the Archdeacon of Barnstable. During his ministry at St Matthew's, in September 1875, an organ was installed at a a cost of £340, although only £300 had been raised at that time. In 1877 the Revd Seymour was succeeded by the Revd Thomas Atkinson and four years later, in 1881, the Revd Henry George Bird became vicar of St Matthew's. In 1888, during the Revd Bird's ministry, the organ was enlarged. Revd Bird was succeeded by the Revd Henry Francis in 1891 when he became the Vicar of St Andrew's Uxbridge. By 1895 we are told that the population of the parish numbered nearly 3000 composed entirely of the working classes. Continued efforts had to be made by the Church to provide for the spiritual well-being of the growing parish. Yiewsley itself was (and still is) a scattered parish, and by this time three Mission Rooms had been provided for the outlying districts. One was at Stockley, one at Little Britain and at present we do not know where the third was situated. Although these were well used the remaining difficulty was the Church itself, its seating capacity yearly becoming more hopelessly inadequate for the ever increasing population. Moreover, it was regarded as being manifestly unworthy to serve as the Parish Church of Yiewsley. Thoughts therefore turned to enlarging the then present Church building and at a public meeting of parishioners, it was decided to consult an architect as to how the Church could be best enlarged. Mr Charles Nicholson, who had already done good work here, was asked to make a report and he suggested that the existing church of Sir Gilbert Scott be used to form the North aisle for the new church, to provide additional seating space, with the new work harmonising with but not copying the old, leaving the old and new to each tell its own tale. His plan was approved at a second meeting by which time more than £500 had already been subscribed by the congregation. Weekly house-to-house collections were organised so that those who wished to do so could give regularly from their wages, whilst the children collected money towards the construction of the porch. The Foundation Stone of the new church was laid on September 24th 1897 and, on Monday April 25th 1898, the enlarged church was consecrated by the Bishop of London. The new nave was of considerable height, 25 feet wide, with massive arcades of Ham Hill stone, with provision made for a future South Aisle. The windows were large with substantial stone mullions and tracery and are glazed with clear lead lights. The walls are built of brickwork and plastered internally, and the roofs, which are tiles, have barrel ceilings of timber. The base of the tower, in which the organ is placed, was built on the South side of the chancel. At the opposite end of the building on the South West corner of the nave, the porch of vaulted brickwork, paid for by the children of the parish, forms the main entrance to the church. Over its entrance is a figure of Our Saviour on the Cross with the Latin inscription Sic Deus Dilexit Mundum, "God so loved the world" (carved by Mr Jenkins of Chelsea). Above the East window of the chancel, looking down over the High Street, is a canopied stone niche in which is placed another figure of Our Saviour, crowned and in an attitude of benediction, the work of the same sculptor. Whilst mentioning the last window of the chancel, in the pattern of the lead lights there is an example of human frailty as there is an error in the pattern - can you spot it? The general effect aimed at in the interior was that of airiness, space and brightness. Messrs. Fassnidge & Son of Uxbridge, who had built the old Church, were the general contractors for the new work, and besides the general works, they made the walnut altar rails the oak entrance doors and certain other fittings. The entrance doorway is rather low and it is thought that it might symbolise that we have to become as little children in order to enter the kingdom or go through the gateway of life. The oak panel over the entrance doors bears a carving of the tree of life and the inscription Janua Vitae, "The doorway or gateway life". This carving is the work of Mr Herbert Read of Exeter, who also made and carved the oak and walnut altar with its Hopton stone 'Mensa' and the elaborately carved pulpit. The pulpit bears the inscription Verbus lucerna pedibus, "Thy Word is a lantern unto my feet". The oak stalls, given for the old Church, with their beautifully carved angels, were adapted to the new chancel, and above the chancel steps hung a large wrought iron cross made by Mr Banks of High Street, Yiewsley. This Cross now hangs in the Parish Centre to where it was removed during the remodelling of the Church in 1994. The four ends of the upright and cross pieces matched the ironwork at the base of the Cross. It is not known when the other three ends were removed or why. The two standard lights before the altar were designed by the architects and are the work of Mr F. Collard. Edward Athelson Harper did the painting of the nave ceiling, a teenager who died of typhoid fever in 1899 at the age of 21. It consists of boldly treated and slightly stylised flower designs, painted in bright colours on a white ground and representing the vine, roses, passion flower and pomegranate between which arc shields in wreaths of rose and vine leaves charged with sacred emblems, the arms of Canterbury and the Royal Arms. There are two shields painted above the Font, one on the North side with builders' tools and the initials of the architect, Clerk of Works, and members of the firm of Fassnidge & Son, the builders; and one on the South side with the chalice and Churchwardens' staves along with the initials of Henry Francis (Vicar), Lancelot Mitchell (Assistant Priest), Alfred Saunders and William Barrett (Churchwardens). The arms of Oxford University are on the shield over the North side of the chancel and bear the words Dominus lllumintio Mea, "The Lord is my Light". The decoration of the chancel roof (mainly executed by the architects themselves) consists of bold friezes on each side. The central portion of the ceiling bearing a representation of the firmament with the sun, moon and stars, the whole on a vermilion ground, and on the ribbons above the lily friezes are painted the words Sanctus, Sanctus, Sanctus. Dominus Deus Sabaoth and Pleni sunt coeli ac tella gloria tua, Osanna, being the words of the Sanctus from the Holy Communion service, "Holy, Holy, Holy, Lord God of Hosts. Heaven and earth are filled with Your Glory, Hosanna." The beam across the Sanctuary roof symbolises the barges on the canal, presumably to indicate that the Barge School, which was run by Mrs. Dyer, was a forerunner of our local School. Mrs Dyer's daughter was a regular member of our congregation for many years. The barrel roof of the nave was washed and only the background repainted in 1955, during the restoration of the Church. The whole roof was washed again in 1959 and 1963 and during the remodelling of the Church in 1994 the whole was washed again and the background repainted. No paint brush has touched Harper's work since he left it in 1898. It remains an outstanding feature of the Church, lovely in itself and as a memorial of the offering of a devout teenager's work. After the Revd Francis had served the parish for fourteen years the Revd Ferdinand Disraeli Sturgess became Vicar of Yiewsley in 1903 and it was during his ministry that the Church Hall in Trout Road was built. The Bishop of Kensington opened the Hall in 1908. The Church Hall survived an abortive attempt to sell it in 1993 and is now providing an income for the church, having been leased to a Montessori School and Nursery. In 1919 a fund was opened to provide a new organ for the Church but just what happened to this fund we have been unable to discover. Possibly it went into Church funds or more likely, towards having the existing instrument repaired. What is certain is that no new organ was installed! The Revd Sturgess died in 1921 and there is a memorial plaque to him on the wall opposite the organ. It was in the same year the Revd John Stephen Langton Jones was instituted and inducted as Vicar of St Matthew's and, after a ministry of seventeen years, he retired due to ill health in 1937. He became a Canon of Wells Cathedral and kept in touch with some of the present members of our congregation up to his death at the age of 103. In 1928 the old vicarage was pulled down and a new one was built on a part of the old site in 1938, and the remainder of the land sold for development as a shopping parade. Whilst the new one was being built the vicar rented temporary accommodation in the nearby St Stephen's Road. On the 18th January 1938 the Revd Frederick William Ruffle became Vicar of Yiewsley and served the Parish for thirty six years. Father Ruffle was Rural Dean of Uxbridge from 1957 to 1967 and in 1960 was installed as Prebendary of Finsbury in St Paul's Cathedral. During this period the centenary of the dedication of the original Church was celebrated in 1959 and, four years later, in 1963, Prebendary Ruffle celebrated his Silver Jubilee as Vicar of Yiewsley. 1966 saw concern over the condition of the Church organ, installed ninety one years previously. This was getting serious and a thorough overhaul and clean was carried out at a cost £459. In 1968 we saw the beginning of an important change in connection with our Church School when it was remodelled and extended. Five years later, on 30th September 1973, shortly after St Matthew's Day, we said farewell to Father Ruffle when he retired after his thirty six year ministry as Vicar of Yiewsley. As a retired clergyman he relinquished his appointment as Prebendary of Finsbury but was appointed a Prebendary Emeritus. Five months later, on 7th February 1974, the Revd John Huegenin Weeks (formerly an Assistant Priest at St John's, Hillingdon) was instituted and inducted as Vicar of Yiewsley. One of the first tasks the Revd Weeks set himself was to seek a replacement for the organ, which had served us for nearly 100 years. Enquiries resulted in obtaining an instrument from St Luke's, Shepherds Bush, which had been made redundant by the demolition of St Luke's. The instrument, a three-manual Henry Jones, was rebuilt in 1977 at St Matthew's by Messrs A. Noterman, who held the tuning contract. During Revd Weeks' ministry at St Matthew's we had an organist who used to commute from Scarborough for Friday Choir Practice and Sunday services. In 1980 the size of our Church School was further increased with the amalgamation of St Stephen's School with St Matthew's under the name of St Matthew's and two years later the School was further extended as another phase in the alterations which started in 1968. The Revd Weeks left in 1983 to become Rector of Hanwell. At this point, the presentation to the benefice (or parish freehold) was suspended and on 21st September 1984 (St Matthew's Day) the Revd Christopher Raymond Gower was licensed as Priest-in-Charge. He was the first Non-Stipendiary Minister in the Hillingdon Deanery. He was joined four years later by Captain Gary Roberts (Church Army) who was licensed on 11th January, 1988. In 1988 the Parochial Church Council decided to investigate the idea of remodelling the original building and extension. A Feasibility Study was commissioned to consider how best to take advantage of the large amount of unused space in the Church building in order to provide a worship space for up to 150 people, adaptable for larger or smaller groups, and a chapel for small groups and private prayer. In addition it was sought to provide a lounge/social area, a parent and toddler room, a choir vestry/practice room, a clergy vestry/office, kitchen, lavatories and storage facilities as well as an entrance foyer accessible from the High Street. The Feasibility Study indicated that this formidable list of requirements was possible and arrangements were made to put the alterations in hand. Although the original suggestion was to sell the Church Hall in Trout Road to provide the funds for the alterations this proved impossible in view of the state of the property market and it was fortunate that the hall was leased at a beneficial rental which supported a loan from the Diocese to enable the work to commence in March 1994. Insufficient funds prevented the construction of a balcony or provision of a kitchen but all the other objects were achieved and the remodelled building was dedicated by the Right Honourable and Right Reverend David Hope, Bishop of London, at St Matthew tide 1994. On Sunday 16th February 1992, Professor John Caldwell was admitted and Licensed as Reader to the Parish and his wife Jill became lay chaplain to the school. She offered herself for training for ordination and was one of the first women ordained to the priesthood in St Paul's Cathedral on 16th April 1994 and joined the staff at St Matthew's. The Stations of the Cross found in the church (the Seventh Station is shown on the right here) were given in honour of this occasion. On Sunday 20th September 1992 Captain Paul Whiteley (Church Army) was licensed as a Parish Evangelist, Assistant Minister and School Chaplain. 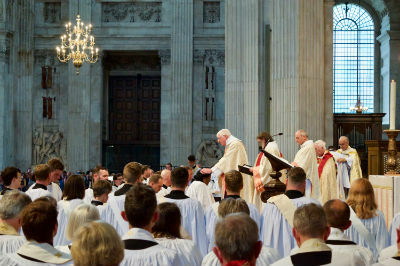 During this time Revd Beverley Allen was training for the Ministry and was ordained in St Paul's Cathedral on 29th June 1996 and served her Diaconate at St Paul's Ruislip Manor. In 1997, after the remodelling, Revd Christopher Gower left St Matthew's to become Rector of St Marylebone; he was joined there by Revd Jill Caldwell and Professor John Caldwell who were respectively licensed as Education Chaplain and Reader. Revd David Waller was licensed as Priest-in-Charge of St Matthew's on 6th May 1997. Prior to David Waller's appointment, George Pinnell, a member of the congregation, had started training as a Reader and was subsequently ordained on 3rd July 1999..
David left in May 2001. A brief interregnum followed, during which – on Sunday 10th June – Mrs Dorothy Laver was admitted and licensed as Reader by the Right Revd Pete Broadbent, Bishop of Willesden. The interregnum ended on November 19th 2001 when Bishop Pete appointed the Revd Sue Groom, formerly Assistant Curate at St Lawrence, Eastcote, as Priest-in-Charge of St Matthew’s. On January 9th 2003 – almost twenty years after the benefice was suspended – Bishop Pete restored the freehold of the parish, appointing Revd Sue as Vicar. This gave a new sense of security to both Sue and the parish by making the post permanent. In June 2005 we welcomed Revd Julia Sheffield to the staff team as non-stipendiary Assistant Curate. We said a sad farewell to Revd Sue and her husband, Phil, in March 2007, when they left Yiewsley for Sue to take on a new role in the Kensington Episcopal Area. After a brief interregnum, on September 6th 2007 the Revd Richard Young was appointed as Vicar. Julia Sheffield left in May 2009 to take up the post of Trainee Chaplain at Chelmsford Hospital. 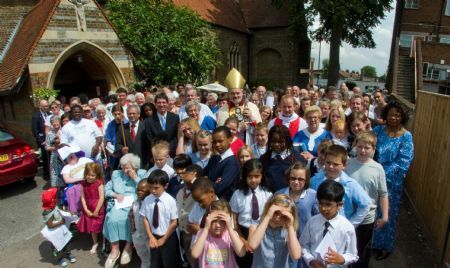 In 2009 we celebrated the 150th anniversary of St Matthew’s in style with a year-long festival of community events. The highlight was the visit of the Bishop of London, Rt Revd Richard Chartres, on 28th June 2009 when Bishop Richard dedicated our new glass doors at the main entrance of the church. Revd Caroline Newbold, who was ordained in 2010 and was curate at St Matthew's until 2013. Revd Vicky Bastidas who was ordained in July 2017 and became St Matthew's new curate. Vicky is the first Colombian woman to be ordained as a Deacon in the Church of England.